This post was originally published in August 2017 and updated in March 2019. When in need of a custom-machined component for a project, choosing a metallic material may be the instinctive consideration to the design engineer. This article is intended to provide educational insight as to a more sensible alternative for precision-machined, high-strength, durable parts: machined polymers and composites. Let’s explore the benefits of opting for a plastic material versus the more traditional metal materials for precision parts. Machined polymer and composite components are the most cost-effective solution when compared to metal. Machined plastic parts are lighter and therefore provide immense advantages over metals by offering lower lifetime freight costs for equipment that is regularly transported or handled over the product’s lifetime. In bearing and wear applications, polymers provide extensive advantages over metals by allowing for lower power motors for moving parts due to lower frictional properties of polymer wear components compared to metals. The low frictional properties provide for less wear as well. The lower wear rates allow for less maintenance-related downtime. Now your equipment can be online longer producing you more profit. Not only are plastics lighter, but they’re also less expensive than many raw metal materials used for parts. Plastics are produced in faster cycles than metals which helps keep manufacturing costs down as well. Plastics are more resistant to chemicals than their metal counterparts. Without extensive and costly secondary finishes and coatings, metals are easily attacked by many common chemicals. Corrosion due to moisture or even dissimilar metals in close contact is also a major concern with metal components. Polymer and composite materials such as PEEK, Kynar, Teflon, and Polyethylene are impervious to some of the harshest chemicals. This allows for the manufacture and use of precision fluid handling components in the chemical and processing industries which would otherwise dissolve if manufactured from metallic materials. Some polymer materials available for machining can withstand temperatures over 700°F (370°C). Plastic parts do not require post-treatment finishing efforts, unlike metal. Polymer and composites are both thermally and electrically insulating. Metallic components require special secondary processing and coating in order to achieve any sort of insulating properties. These secondary processes add cost to metallic components without offering the level of insulation offered by polymer materials. Plastic and composite components are also naturally corrosion resistant and experience no galvanic effects in a dissimilar metal scenario that require sheathing. Unlike metals, plastic materials are compounded with color before machining, eliminating the need for post-treatment finishing efforts such as painting. The benefits and features of plastic materials over metals discussed above span across multiple industries, showcasing the utility and versatility that plastic brings to the table. Lightweight: Polymer and composite materials are up to ten times lighter than typical metals. A reduction in the weight of parts can have a huge impact on an aerospace company’s bottom line. For every pound of weight reduced on a plane, the airline can realize up to $15k per year in fuel cost reduction. Corrosion-Resistant: Plastic materials handle far better than metals in chemically harsh environments. This increases the lifespan of the aircraft and avoids costly repairs brought about by corroding metal components an in-turn reducing MRO downtime provides for more operational time per aircraft per year. Insulating and Radar Absorbent: Polymers are naturally radar absorbent as well as thermally and electrically insulating. Flame & Smoke Resistances: High-performance thermoplastics meet the stringent flame and smoke resistances required for aerospace applications. Sterility: In the medical industry, cleanliness is vital when it comes to equipment. Infection is the greatest threat facing hospital patients. Polymer and composite materials are easier to clean and sterilize than metal. Radiolucency: Radiolucency is the quality of permitting the passage of radiant energy, such as x-rays, while still offering some resistance to it. Surgical instruments and components manufactured from polymer materials allow the surgeon a clear unobstructed view under fluoroscopy. This allows for safer, more precise surgeon outcomes in the OR. Metal instruments impede the surgeon’s view. Lightweight: Plastic and composite surgical components allow orthopedic OEMs to meet ergonomic weight limits for surgical trays. Each metallic instrument adds weight and strain to the surgical team carrying and using metal instruments. 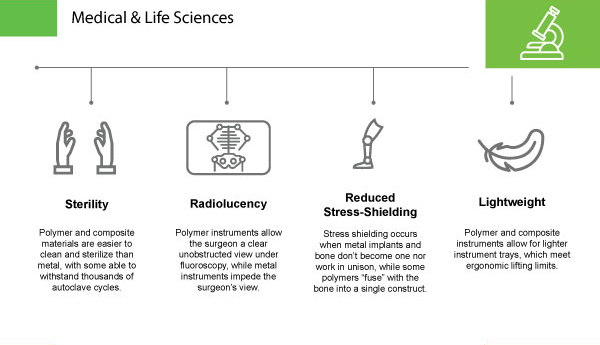 Reduced Stress-Shielding: Stress shielding occurs when metal implants and bone don’t become one nor work in unison. In medical-grade polymers like PEEK, however, its similar modulus to bone “fuses” with the bone into a single construct. High Tensile Strength: Several lightweight thermoplastics can match the strength of metals, making them perfect for industrial equipment metal part replacement. 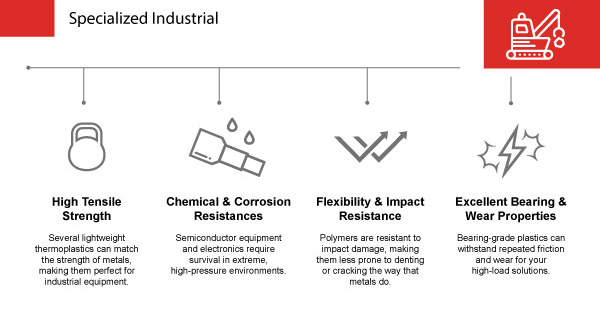 Chemical & Corrosion Resistances: Semiconductor equipment and electronics require survival in extreme, high-pressure environments. Flexibility & Impact Resistance: Polymers are resistant to impact damage, making them less prone to denting or cracking the way that metals do. Excellent Bearing & Wear Properties: Bearing-grade plastics can withstand repeated friction and wear for your high-load solutions. Weight, corrosion, and sealing: Plastic materials allow the oil and gas industry to explore deeper depths than ever before by offering tool weight reduction without a loss of strength as well as materials which offer superior sealing attributes. 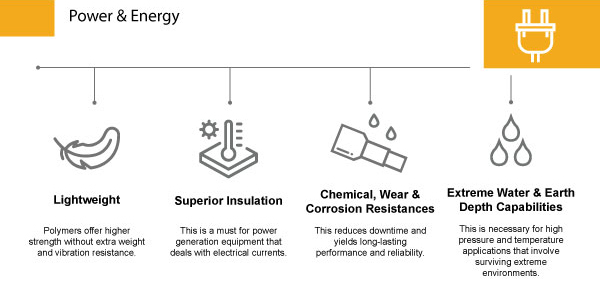 Superior Insulation: Naturally insulating plastics provide for superior thermal and electrical insulation over metals, which is a must for power generation equipment that deals with electrical currents. 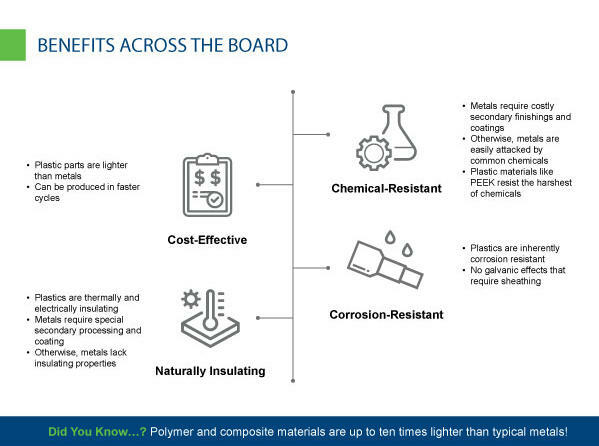 Chemical, Wear & Corrosion Resistances: Plastic components with a strong chemical, wear and corrosion resistances reduce downtime and yield long-lasting performance and reliability. Extreme Water & Earth Depth Capabilities: These qualities are necessary for high pressure and temperature applications that involve surviving extreme environments. 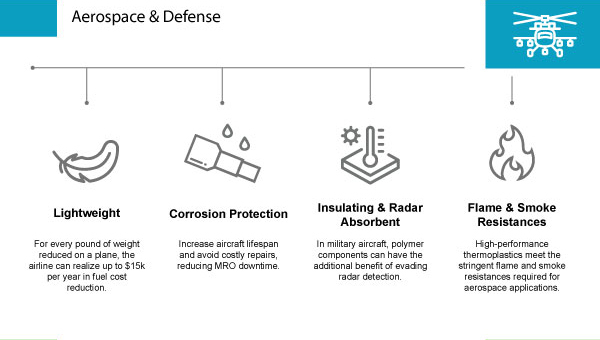 As you can see, plastics have a variety of unique attributes which place them above metals in terms of utility, cost-effectiveness and flexibility for precision-machined components. Search specific plastic materials and their applications per industry with our useful material search function. Take Our Material Expertise with You.